An original painting commissioned by a private collector. Capturing the excitement of another home run by A-Rod, the soon to be proclaimed best player in baseball and the highest paid ever. 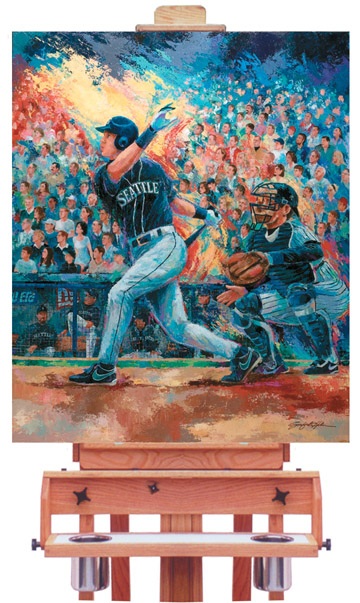 The dramatic painting shows the immediate crowd reaction as he rockets the ball over the fences with his trademark swing. The catcher watches helplessly as the ball reverses direction from A-Rod's tremendous power. Contact us if you are interested in acquiring an original Masters Edition giclee of this extraordinary image.This unique and original multimedia artwork is for the art collector who appreciates the finest expression of the artist's style and technique. Holien applies texture and pure color with palette knives and brushwork over a Giclee foundation. After his original work on the canvas, it is mounted in a deluxe multi-profile frame with a fabric covered liner and a custom signature inset to display the personal autograph or memento included with the painting.